Go back and listen again to Yanni's melodies composed over an incomparable 30+ year career and it becomes clear—the man's music was meant to be sung. Revered for his sweeping symphonic pieces, intimate keyboard airs and unforgettable musical themes, Yanni long resisted having vocalists reinterpret his music with lyrics—until now. His premiere Disney Pearl album, Yanni Voices, was over two years in the making and is without question Yanni's most ambitious project yet. Teaming up with GRAMMY and Academy Award-winning producer Ric Wake, Yanni took on a mentoring role for this project, discovering and producing four young singers—Nathan Pacheco, Ender Thomas, Leslie Mills and Chloe. Pairing their vocal talents with both his old and new compositions, Yanni encouraged the four singers to write lyrics for the melodies that moved them most. It proved a winning gamble. On the CD, Yanni and Wake effortlessly wove a mainstream sensibility with modern rhythms, Mediterranean sensuality, Latin passion, and operatic flourishes. Add to that Yanni's expansive arrangements and you have compositions that will appeal to a global audience . The singers then accelerated the energy beyond the composer's wildest dreams. "I knew," says Yanni, "if we could match the melodies with the right lyrics and voices, we would be adding powerful layers beyond just the instrumental music, giving a re-birth to these compositions...I believe that the human voice is the most powerful and expressive instrument known to man"
With careers stretching over decades, Yanni and Wake were in a good position to guide their four singers (the "kids," as they call them) and to allocate the division of vocal labor. Given her rock background and powerful range, Chloe was perfect for songs like the sensual "Kill Me with Your Love" and "Change," a song originally written for Yanni's unforgettable performance at the Taj Mahal. "When I thought I wanted to do something more rhythmic, Chloe came into the picture," says Yanni of his young protégé. Conservatory-trained tenor Nathan Pacheco excels in classically influenced songs like "Adagio in C Minor," "Tribute" (Yanni's 1997 hit heard in every Olympics since it was recorded) and "Enchantment," based on Yanni's original composition from the Grammy Nominated 1993 album In My Time. Says Yanni of the latter track, "It was originally written for piano and then developed for orchestra. Now Nathan takes the song to a whole new level. It's one of the best he does. In My Time is one of my all time favorite albums because of its simplicity and melodic strength. Leslie Mills is gifted with what Yanni calls "the Mother Earth voice," and it's hard to argue with his appraisal. A skilled songwriter and a true poet once signed to Paul McCartney's publishing company, Leslie's gentle, almost fragile quality adds palpable intimacy to songs like "The Keeper" and "Before the Night Ends." On the opposite end of the spectrum, Venezuelan-born Ender Thomas is the team's resident master of Latin fire, as heard on tracks like "Bajo el Cielo de Noviembre" and "Desire" (based on Yanni's 1992 composition from another GRAMMY nominated album, "Dare to Dream"). Says Yanni, "Desire is very Mediterranean influenced: Moroccan, Spanish, Greek and Middle Eastern with a modern driving beat. Ender just exploded on that song." And just to mix things up, Yanni and Ric paired Ender and Chloe on a moving Spanish-English duet, "Until The Last Moment," based on a 1993 Yanni classic first performed live at the Acropolis in Athens. Since they launched the Voices project more than two years ago, life has taken on an ascetic quality for both Yanni and Wake. Hunkered down at "Camp Yanni" (as they refer to Yanni's Florida studio complex) and huddled together with Nathan, Ender, Leslie and Chloe, the two continue to write and record all day and into the night. So far they have recorded more than 130 songs, including debut solo albums by all four singers. "We probably packed four or five years of work into two," Yanni says. "If you focus that much on one subject, your mind accommodates you. You rise to a level not normally accessible to you." Why Ric Wake? Few other producers have had as much success turning young vocalists into stars. His track record includes developing and producing artists like Mariah Carey, Celine Dion, Whitney Houston and Jennifer Lopez, in addition to his Oscar-winning production of the musical feature film, "Chicago." But he and Yanni were friends long before they decided to join forces professionally. "We were both at a time in our lives when we were trying to figure out what to do next musically," Wake recalls. "Eventually after months of hanging out I said, hey, we should do music together and I told him the concept of ‘Voices.' At that point I was immersed in his music and realized that Yanni is a genius, his musical themes are timeless; many consider him the Mozart of our time. I thought if we could put voices and lyrics to these powerful melodies we would be creating something magical that will touch the world." "He's been a great influence," Yanni says of Wake. "I'm relieved to have someone I can trust and bounce ideas off. So far we've pretty much never left the studio. I thought when I got tired I'll take a break, but I never got tired. This is the best time in my life right now." That life has encompassed enough artistic achievement and popular success to span several careers. Born Yannis Chrysomalis in Kalamata, Greece, Yanni came to the United States as a teen to study psychology at the University of Minnesota. He had been a champion swimmer, breaking the Greek national freestyle record at age 14. But music remained his principal passion, and though he had no formal training, Yanni poured his energy into developing a music career. He performed with numerous Rock and Roll bands in the late 1980s, but eventually went out on his own to pursue an original path, writing and performing instrumental music that adhered to his guiding principle: music as a liquid medium that cannot be held, contained or cornered. 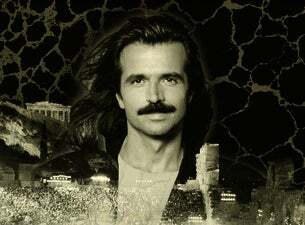 Throughout the late ‘80s and ‘90s, Yanni released a string of albums, all of which became global hits. They include Dare to Dream (1992), In My Time (1993), Niki Nana (1989), If I Could Tell You (2000) and his crowning achievement Live at The Acropolis, recorded live at the 2000-year-old Herod Atticus Theatre in Athens, captured by 14 cameras and assembled into one of the most popular PBS specials ever. He also gave spectacular live performances at signature locales like India's Taj Mahal and Beijing's Forbidden City. With multiple world tours before millions, and more than 35 gold and platinum album awards to his credit, Yanni had finally earned a break. But he never grew comfortable with the downtime, which led to his partnership with Ric Wake and the Voices project. Add in the power of Disney, and Yanni is clearly set to soar again. In a world so seemingly precarious, can music change lives anymore? Ask Yanni and he'll tell you he still has plenty of faith in the power of art. "If I can play a small role in getting people together, introducing cultures to each other and show our common ground," he muses, "I would find this to be most fulfilling." That sounds like the voice of reason—and with Yanni Voices, it's also the sound of extraordinarily beautiful music.